mr.Snack – Vending Machines Store OpenCart Template is a fresh Vending Machines Store OpenCart Template, that is perfectly displayed on different types of screens. The site, built on this template, can be supplemented with various sections, including a blog and news. The drag & drop tools simplify the construction process of custom pages as much as possible. mr.Snack is a powerful and professional template that will serve for an online store website of any format. 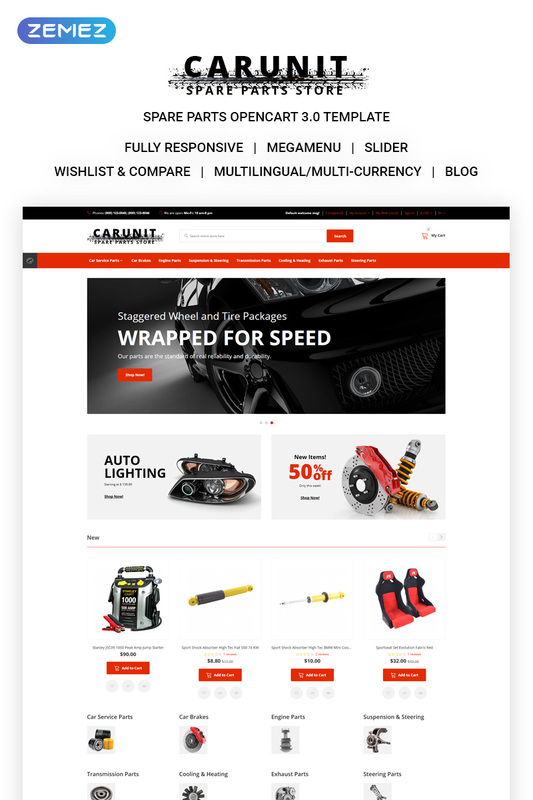 CarUnit – Spare Parts OpenCart Template allows you to develop a resource that is friendly to your visitors. This Spare Parts OpenCart Template will help you in the development of projects affiliated with spare parts and other services related to cars. You’ll find here a lot of features that are useful for work. Like a convenient admin panel and the ability to add social network buttons. Everything is balanced and the quality of the template itself is very pleasing. Online Shopping – Responsive OpenCart Theme is a Fully Responsive Theme with Responsive Slider and Responsive Hero banner. Freeze Refrizerator – OpenCart 3 Theme is a Ecommerce Theme. It comes with Creative layout with fully responsive, clean and elegant design and also additional features like product view with additional images in featured, bestseller, latest and specials. Other features such as feature in header, Vertical megamenu and mobile menu,Unique Product detail design, Convenient product view, Product zoom with additional image slider, product image thumb with additional images view, product slider, Hybrid Module, Ajax cart,Blog/latest News etc. Sonca – Powerful eCommerce OpenCart Theme is one of the hottest themes in Responsive OpenCart 3 Theme Collection. It is outstanding, with gorgeous design that can match any online market store. If you are looking for a website template built on OpenCart, Sonca will be an excellent choice. It is not only compatible with OpenCart 3, it is built with RTL support and provides more than 50+ page styles for shop. This OpenCart 3 Theme is greater than what you expect. With a few clicks, you completely utilize the following features! Electrolux is a robust and modern looking OpenCart template built for electronic gadgets, home appliances, digital accessories and more. If you need to give a facelift to your eCommerce store, or create a brand new one, this template could be of a great use to you. If you need it to look different from the demo, use a theme color switcher with 4 pre-build color choices and pick the one that suited the most to your business. Showcase your most popular products by placing them on product banners and sliders. Present your computer stuff online with our efficient design and it will become available to unlimited number of customers. Let us draw your attention to impressive visual effect in a slider on image transition. Featured products are placed in a three column structure. Banners in a sidebar advertize special propositions.